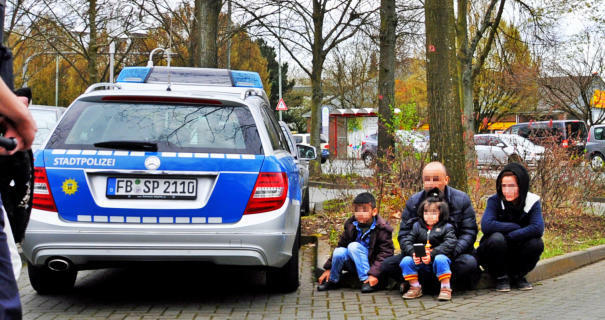 An Iraqi family laid down in the street blocking traffic in Karben, Germany. They were protesting the government for their own house. The family had been in Karben for 24 hours. The Iraqi family were told they’d get their own home when the migrated to Germany. If Europeans treated their children the way these “refugees” treat theirs, deliberately exposing them to jeopardy in order to get what they want, their children would be taken away from them for child neglect, but yes, different standards apply to the new european overlords. They get away with murder. Already have. On Monday, a refugee family from Iraq blocked a major traffic road in the centre of Karben. In the middle of the traffic the driver lay in front of the cars – he wanted himself, his wife and his children to be run over. In Iraq he had been promised a house – he is now demanding that. The man lay in front of the first car, and asked the female driver from Kloppenheim to drive on. He also wanted to drag his child down. “The child was really afraid”, says the upset driver. She climbed out, tried to get the man to stand up. Two civil police who happened to be going past were finally able to drag the man away from the road. According to mayor Guido Rahn (CDU) the family has been in the city since Wednesday. Already on Thursday the four had protested against their accommodation in a city refugee centre through a sitting strike at the entrance to the town council building. “They insist on getting their own house, because that was what they were promised in Iraq,” says Rahn.